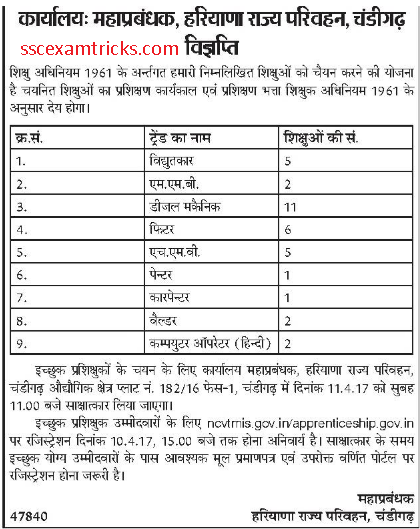 Haryana Roadways Chandigarh Apprenticeship Application Form 2017 – www.ncvtrnis.gov.in - HRTC Chandigarh ITI Apprenticeship Training Interview Result 2017 - www.apprenticeship.gov.in. 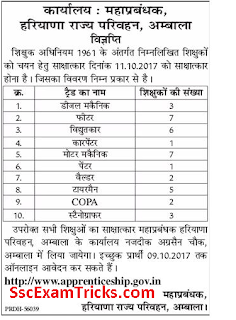 Latest News (27.10.2018) - Haryana Roadways Apprentice Panchkula online forms available now. 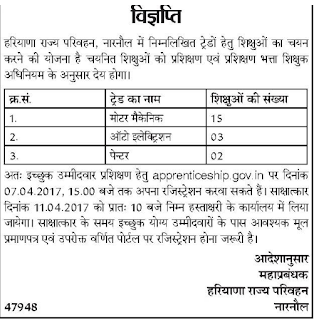 The good news is that Haryana Roadways has notified for apprenticeship/ ITI training program for various trades ITI holders on the website. 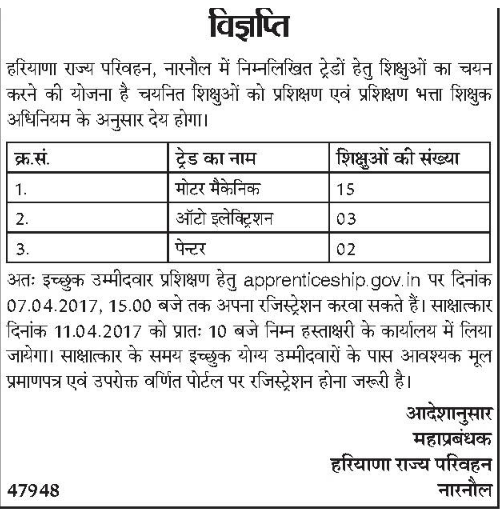 The interested ITI holder can register for Apprenticeship in Haryana Roadways Narnaul before 07th April 2017 till 3:00pm on the official website. The Selection List for Apprenticeship / ITI Training will be available on 11th April 2017. 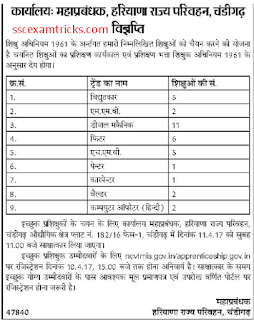 Haryana Roadways Transport Chandigarh has notified on 21st March 2013 in which online applications were invited for Apprenticeship/Training of ITI (various trades) holders. The online registrations are closed on 10th April 2017 up to 03:00pm. Huge numbers of candidates who have been waiting for training/apprenticeship in Govt./authorized centres have shown their interest in this notification. The selection of candidates will be based on direct interview. The interview has been scheduled on 11th April 2017 at 11:00am. At the time of interview, all original documents along with application form (duly filled and submitted online) and registration number of the candidates will be verified by the officials. The salary/payment/stipend and training period will be considered under Apprenticeship 1961 act. Those candidates who are ready to register can apply online through direct link given here. · Read all the instruction belongs to education qualification. · Then click on applying link. · Fill full form with correct details. · Upload your resume, qualification and Haryana domicile certificate. · Click on submit button for registered your form no. 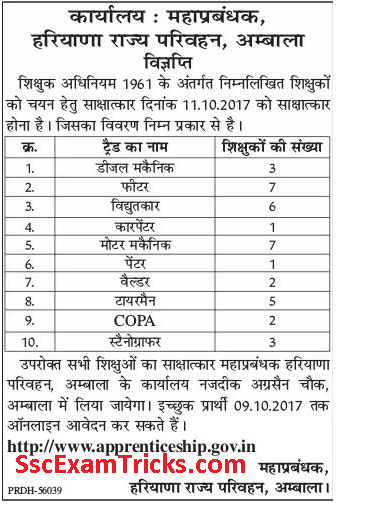 After that you can check Haryana Roadways Apprentice Result 2017 from direct link given at the bottom of the page. 1. Go to the official website, click on the apprentices and select apprentice registration and click on the result link given here. 2. Search your roll number/registration number and password.